I’ve got another food/wine pairing for you. 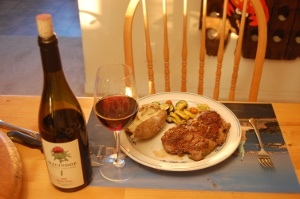 I’m a big lamb fan, especially in the Spring, and found this year that Pan-Seared, Flash-Baked Marinated Lamb Steaks pair perfectly with Macindoe Family Cellars’ 2008 Eola-Amity Pinot Noir. The acidity in the wine cut through the weightier, dense flavors of the lamb, and the mushroom, wet forest floor, black tea flavors of the wine complemented the gamier flavor of the steak. The dark fruit flavors also lend the tiniest hint of sweetness to the overall flavor profile (which is great if you oversalt your food like I do). AND – the icing on the proverbial cake, the 08 Eola-Amity was aged in 33% new French oak, which enhances the smokey flavors of the pan-seared lamb. I served salt-encrusted baked potatoes and roasted zucchini/squash/carrots with sea salt and rosemary, but I wasn’t married to either of those sides. So, I won’t bother extolling their virtues. Here’s the recipe if you want to try it out at home! So, basically, you go out and buy some lamb steaks – One per person! They’re actually called lamb leg steaks, but for some reason that just sounds too “leggy” to me, so I’ll call them steaks. Put them in a ziploc baggie with some olive oil (two glubs per steak), some rosemary (chop this up finely if you are cooking for the boss or an ex or something – rosemary can be chewy), some garlic (1/4 clove per steak-ish), a squeeze of lemon, and five or six grinds of black pepper. Let em sit. Doopy doo. What are you doing? Maybe grab a glass of wine while you’re waiting. MFC Roussanne is always a nice pre-dinner choice. Or, it’s Spring.. you could grab a nice rosé. Mingle if anybody’s around. Any chores to do? I guess you could do them. Or you could marinate it in the morning and come back home to nice marinated steaks at night. OKAY! Let’s assume they’re ready. We have been patient. Fire up that oven to 500 degrees. Get a pan that will fit your steaks and will fit in your oven (and is allowed to be in the oven). I’ll assume you have two and you like them medium rare. Heat up that pan as high as it will go. Keep it dry as a bone, dry as the sahara, dry as mighty dry. Once the pan is mighty hot and your oven is preheated, toss your two steaks in it. SIZZLE SIZZLE SMOKE!! (okay, i admit, it’s a tad smokey) TIME: 30 seconds from the moment it hits the pan. GO! 3, 2….1… FLIP! Now, time another 30 seconds.3, 2, 1…. now, move the pan swiftly, yet safely, to the 500 degree oven. Put it in! Time two minutes, pull out, flip. Two minutes…. OUT! Move it on to a plate, let sit for 1 minute. ENJOY…. with your vino! Very delish. Very fast. Very easy. And very good with Pinot, I must say.